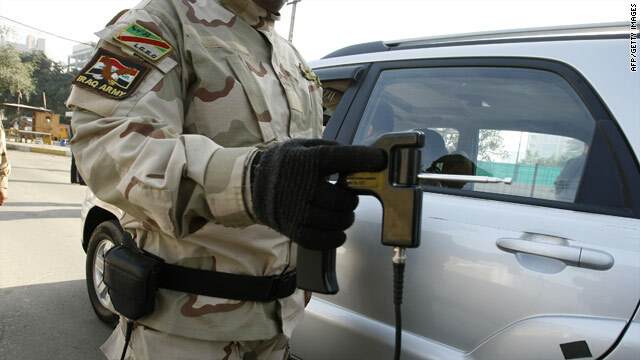 The handheld ADE651 has been used in Iraq and Afghanistan to detect explosives. London, England (CNN) -- A British man who allegedly sold fake bomb detectors to Iraq and Afghanistan has been arrested on suspicion of fraud, police said. The British government has also imposed an export ban on the device, known as the ADE651, effective Monday. The handheld device is commonly used at checkpoints in Iraq and Afghanistan to detect explosives. The 53-year-old unidentified suspect, who was arrested Friday, is accused of knowingly selling a product that didn't work, police said. Tests show that the ADE651, and similar devices, were not suitable for bomb detection, a spokesman for Britain's Department of Business, Innovation and Skills said in a statement. "As non-military technology, it does not need an export license, and we would not normally need to monitor its sale and use abroad. However, it is clearly of concern that it is being used as bomb detection equipment," the spokesman said. The spokesman said the export ban only applied to Iraq and Afghanistan because its legal powers to control the sale of the product were "based on the risk that [the device] could cause harm to U.K. and other friendly forces."